Tags: Asia Player of the Year, Mike Takayama, The Philippines. Remember Mike Takayama, the first Philippine poker player to win a WSOP bracelet this past summer? Well, he has made his home country proud once more, because it turns out that his WSOP bracelet win helped him become the 2018 Asia Player of the Year! Mike Takayama, age 29, an ex-billiards pro player from Mandaluyong City, Metro Manila, has been crowned the 2018 Asia Player of the Year (APOY), thus becoming the first Philippine poker player ever to win the prestigious title. He topped this year's APOY Leaderboard with 10,230 points. The player who ranked second was Alexis Lim with 5,931 points. The race covered the period between November 27, 2017 and August 12, 2018. The winner's name will be engraved on the special trophy and they will also be awarded a cool amount of $20,000. Takayama said he's planning to invest the prize in a billiards-themed café. Takayama said, "I feel very happy because winning the APOY is a dream! A lot of players also aspire to win this award. I hope they use me as an inspiration. There are a lot of excellent Filipino poker players who are still waiting for their big break. Just continue playing and you can also win like me. Perseverance is key. I would also like to thank my wife for supporting me through everything, and I would also like to thank God and my friends." 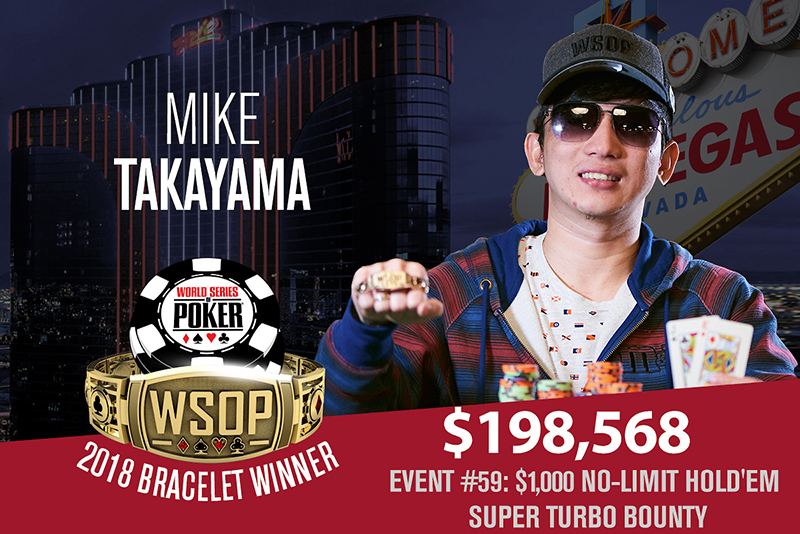 During the APOY race, Takayama's highest score that obviously propelled him to the top spot was when he emerged victorious at the 2018 WSOP Event #59: $1,000 NLH Super Turbo Bounty, defeating a player field of 2,065 entries for $198,568 plus his very first gold bracelet. His first gold bracelet was also the first-ever won by a player from the Philippines. He said, "I'm very happy, because winning the bracelet is everyone's dream. 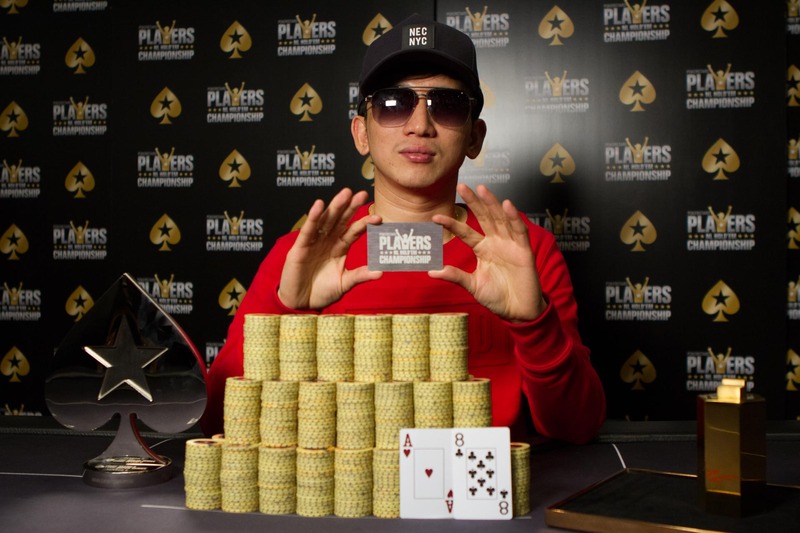 I'm the first Filipino to win a bracelet, so I'm really, really, really happy about that." Also, he's a Metro Team Pro and was able to secure a seat into January's PSPC after winning a $30k Platinum Pass at the PokerStars LIVE Manila Super Series Season 5 (he won the Warm-Up event for $5,106 and also the Main Event for $17,875). Takayama started out his poker career when he managed to win a local international event for a brand-new BMW vehicle. Since 2010 in the live tournament circuit, he has accumulated a total of $936,583 so far, putting him in 3rd place on the Philippines all-time money list, behind John Tech in 2nd ($1,106,221) and the late Noli Francisco in 1st place ($1,350,550). 14 comments for "Mike Takayama becomes First Filipino Ever to Win 2018 Asia Player of the Year"